Ride up to the 124th-floor observation deck in a high-speed elevator. 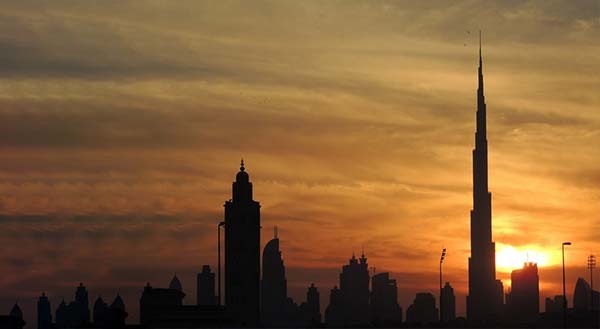 Watch a multi-media presentation about Dubai and Burj Khalifa. Take in incredible views over the city, ocean and desert from one of the world's tallest observation decks. Use the telescopes to see top Dubai attractions including Palm Jumeirah and Dubai Marina. Immediate Entry Admission for Infants 04 years and below. At 456 meters, Level 125 offers a spacious deck tastefully decorated in Arabic mashrabiya for stunning 360-degree views. Step on to, Dubai – A Falcon’s Eye View that allows you to explore Dubai as you fly over the city. Take a closer look at the world below through high powered telescopes. Step out onto the public outdoor observation terrace overlooking the ever-growing skyline. Enjoy a personalized tour, guided by a Guest Ambassador. Refresh yourself with signature refreshments at SKY lounge. Continue your journey to levels 125 and 124.